The Arguileh Smoker illustration by Maya Fidawi. I still don’t have a clue as to who the Lebanese are. Are they mad, fun-loving, neurotic, image-conscious, corrupt, kind, proud or paranoid? Yesterday I went to the Virgin bookstore next door to the grand Mohammed al-Amin mosque (I know, right?) and asked a clerk there if he could recommend a book that might help me understand the character of the Lebanese people. He suggested two books: The first is titled Spirit of the Phoenix: Beirut and the Story of Lebanon and looks to be one of those serious treatises often written by former BBC journalists (which it is), and the second, Life is Like That: Your guide to the Lebanese is an illustrated tongue-in-cheek exploration of various Lebanese stereotypes compiled by the editor of the Lebanon Daily Star, Peter Grimsditch, (who claims to be a devotee of raw liver and arak for breakfast) and Michael Karam, a Lebanese expat who returned to Lebanon in 1992. I should probably have started with the more serious exploration of the Lebanese but the truth is I find the comic exploration of what it means to be Lebanese much more entertaining. 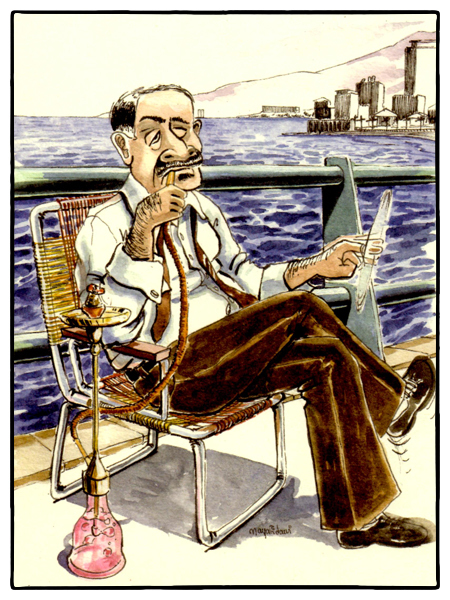 “Arguileh smoker is a serious sort of chap. He is a government employee, and therefore by nature a man who knows what he wants in life; and that is a good honest smoke. While soccer fans may argue the merits of Ansar over Nijmeh, he devotes serious time to the seemingly endless debate over what is the best tobacco: m’aasal or ajami? In fact, he despises devotees of the former. They are nothing more than faddists, lightweight smokers, swept up by the recent trend for aragueel. The tourists have made the arguileh as common as a hamburger. And as for those plastic caps and the easy-to-light charcoal, well that just proves his point. He learned to smoke at the age of six when his grandfather, the village abaday or hard man, gave him his first puff. That time he nearly fainted but by the time he was ten he had the lungs of a man of 50. These days, he and his fellow smokers often take their families for roadside picnics where they unpack their luxury arguileh travel kits made by Mansour of Aleppo. 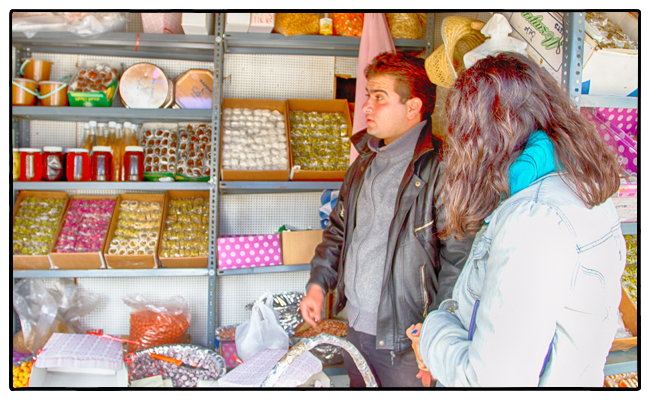 A candy seller with boxes of malban and noughats outside the Cedars of the Lord. Photo by David Lansing. I couldn’t bring myself to buy any of the Lebanese cedar tchotchkes but as I wandered down the road, I came across this guy selling candy. He offered me a sample and it was delicious—sweet, chewy, and very apricoty. This is Lebanese malban which is very much like Turkish Delight only better, I think. At least this batch was. Traditionally malban is made with grape molasses, flavored with rose water or orange blossom water, and thickened with starch. Traditionally it is stuffed with pistachios but this guy had all kinds of malban and noughat—dried peach, rose flowers, cashews, bergamot oranges, pears, dried apricots, and several different versions of pistachio malban. I asked him to put together a mixed box of various candies, thinking I’d take them home with me. As he was doing that, I noticed Waffa sitting on a bench up the hill from me. She looked as melancholy as I’d felt walking through the cedar grove. I don’t know if it was because she was remembering coming up here as a child or if she just found the whole seen a bit less spectacular than what she’d been hoping for. In any case, I told the candy man to make me a second sampler of his malban, which I gave to Waffa when we got back in the car. She was delighted. The two of us munched on the bright, chewy candies as our car slowly wound its way down through the Qadisha Valley and back to Beirut. An ancient tree in the Cedars of the Lord forest. Photo by David Lansing. The Cedar of Lebanon is the most famous tree in the Middle East. Wood from these trees were used to build the original Temple of Solomon (they are mentioned in the Old Testament) and some say Noah built his ark from these trees. Today, there are only a few groves left, due to the deforestation that has taken place over the last milennia. A few trees are now being planted, but it will be centuries before this exceptionally slow growing species matures (it takes at least 40 years before it can even produce fertile seeds). 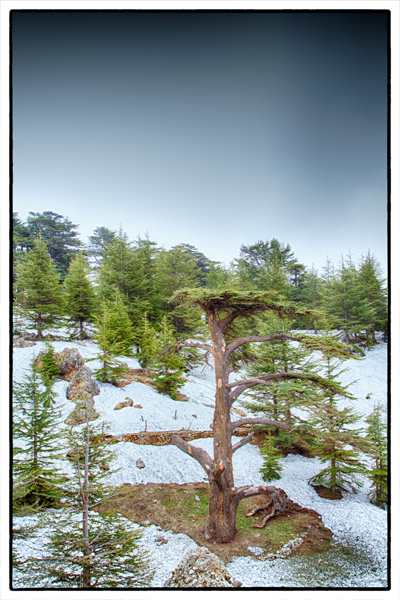 Some of the trees we saw in the Cedars of the Lord forest near Bcharré were thought to be well over 1,000 years old. I found them to be a melancholy bunch, often sitting isolated in a patch of snow, many of their limbs chopped off. They say there are very strict rules about taking any timber from these remaining trees (some 400 plus) and that the souvenirs you see in stalls up and down the road beside the cedar groves are made only from fallen branches. I don’t know. What I saw were dozens of sacred cedars who looked like multiple amputees coming home from a horrendous war. Look at the tree in the photo above. This is an old man, a tree that began its growth when Muslims conquered Jerusalem, William of Normandy invaded England, and Genghis Khan terrorized the Chinese. Now the poor old guy has a flat top and just a few limbs left. You can see the scars up and down his trunk. Do you really think all those missing limbs were the result of fallen branches? 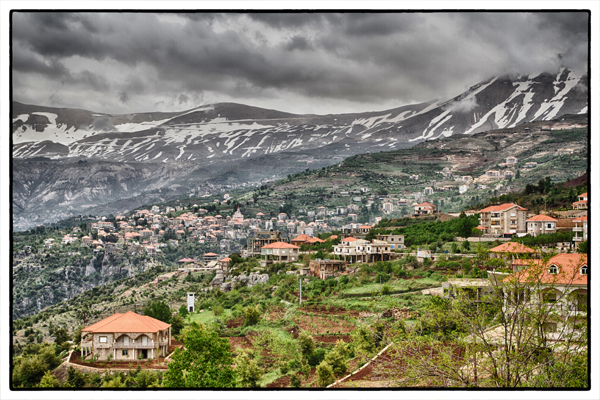 The fact is, the people here—like most Lebanese—have a difficult life. And many locals depend on the “fallen limbs” from the ancient cedar trees to make the tchotchkes—wall clocks, name plates, round ashtrays with bark all around—they sell to tourists. This is how they make a living. I suppose to them cutting off a branch with a slight crack in it from a windstorm is like the Masai in Kenya bleeding one of their cows; the organism survives and sustenance is provided. The town of Bcharre in the Qadisha Valley. Photo by David Lansing. Waffa wanted to get out of Beirut. I felt the same. So early Saturday we hired a car to take us to the Cedars of the Lord forest near Bcharré. Bcharré is not far from Beirut as the crow flies (maybe a 110k), but once you leave the coast at Chekka, it is a slow, winding road through the heart of the Qadisha Valley. I was worried that, since she hadn’t been up to Bcharré in several decades, that it would satisfy neither her memories or my expectations, or that the town would still show the wounds of the war when it was a bastion of Christin resistance against first the Palestinians and then the Syrians. But whatever damage it had suffered seems to have healed with the passage of time. 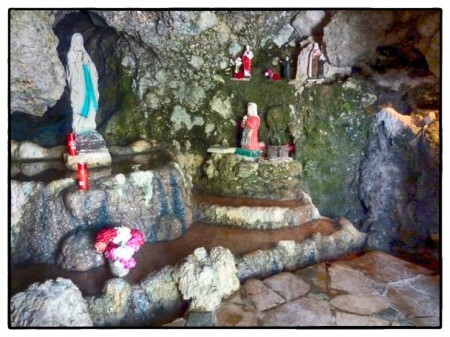 The grotto of the Virgin Mary in Bcharre. There are two things Bcharré is known for: It is the birthplace of Khalil Gibran and there is a small museum dedicated to him here, and, not far from the museum, is a small cave with a spring called the Notre Dame de Lourdes Grotto where, legend has it, the Virgin Mary took pity on a Carmelite gardener-monk, who had to carry water up to the monastery each day to water his vegetable patch, so he made a spring appear in the cave. Both Waffa and I were more interested in seeing the miracle spring in the grotto than the Gibran museum. But, truthfully, there was little to see—just a few toy-like statues, a few candles, and a couple of faded bouquets. Still, something about the scene moved Waffa deeply. Perhaps remembering visits here as a child. We stayed for 10 or 15 minutes before returning to the car. 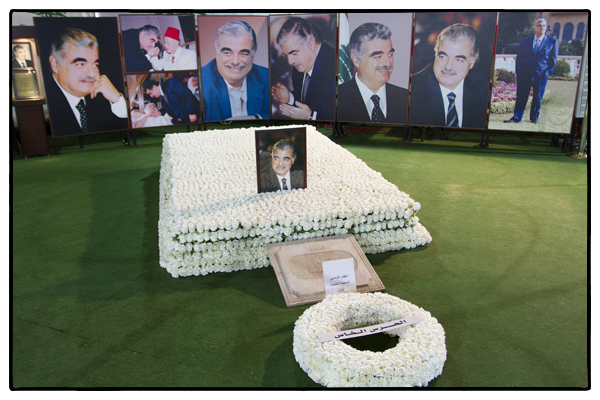 Hariri’s gravesite, beneath the big top, in downtown Beirut. Photo by David Lansing. So. I went to the café where Lebanon’s former Prime Minister, Rafiq al-Hariri, sipped his last cup of coffee. Then I stood on the very spot where he was assassinated by a truck bomb. This morning I went to his rather macabre grave site next to the Mohammed al-Amin Mosque directly across the street from the Martyrs’ Square Statue (riddled with bullet holes from the Lebanese Civil War). I asked several Lebanese why Hariri’s grave was housed under a white tent 8 years after his death and got various reasons. One was that the entire Martyrs’ Square is being redone and once it’s completed, visitors to Hariri’s grave will be able to turn around and look directly at the Martyrs’ statue. But I like the reason I heard from an old man who was paying his respects the same morning I was. He told me that the temporary tents would remain in place as a reminder that until the persons (or state) responsible for Hariri’s death were brought to justice, Hariri would not permanently rest in peace. We’ll see, once Syria’s president Bashar al-Assad is toppled, whether this is true. I hope so.